I declared my intention, over and over in my head, to “hit the ground running” upon my arrival in London. After three weeks of pounding the pavement with a heavy laptop on my back during my daily commute, I developed plantar fasciitis, an injury to the connective tissue at the arch of the foot. After a range of treatments, including stretches and shoe inserts, tonight was the first night I could walk home from the tube at a normal pace without pain. It has been nearly three months since they stamped my resettlement visa at Heathrow Airport. Since that time, I have been putting one foot in front of the other, journeying toward what I hope might one day feel like “normal” life again. Each step has been an act of faith, and often what I thought looked level turned out to be uneven ground. So often, whatever I assumed, culturally or logistically, has been perfectly wrong. My parents are over to visit, giving me fresh eyes on my new circumstances. Having them here brings a much-needed sense of continuity back to me. Still, the journey ahead is one I must ultimately take on my own — toward an understanding of what brought me here, and how to stand tall on foreign soil, sure-footed in this strange new land. Each chapter of John Rember’s MFA in a Box can be read in the time it takes to travel between Finchley Central and Leicester Square station on the Northern Line of the London Underground. I know because I read it this way. At least, I read full chapters on the days I could claim a seat. Other days, I read what little I could at the distance of two inches from my nose, using the book as a v-shaped shield against the armpits of businessmen’s suit jackets as they made their way into the The City to plan the next financial collapse. A recent transplant to London from a rural town in California, I was following the “when in Rome” adage — immersing myself in written ideas to transcend the fact of my animal body crammed in with the warmth and smell of my fellow humans in a speeding subterranean metal box. Each article in the tabloids unfurled all around me had been engineered to be read in the length of one tube stop. By a precise mix of fact and moral opining, they were also designed to provoke an “Isn’t that terrible?” reaction, before being discarded in the overflowing waste bins at the top of the stairs. I was reading a book about why one should try to write literature. 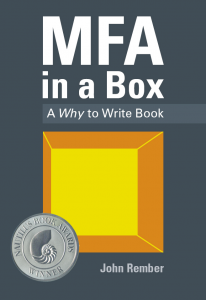 But in fact, MFA in a Box is about much more than this. It is about how to survive, and perhaps even thrive, through writing, in this highly-engineered world. I met John during my first residency in the Pacific University MFA in Writing Program. It was less than a year after the death of our infant son. John gave a talk that was to become chapter eight, about The Book of Job, and Leviathan, and why one should “go deep” in the process of writing — as “conscious dust” in a cosmos that we can only pretend to control, wrapping our arms around the big human questions because we are human, and questioners, and big and deep at our core, despite our cultural contract that says we should instead keep lacquering the surface. I have heard some say of parenthood that if people knew ahead of time what would be involved with raising a child, most would not go through with it. I am beginning to suspect the same can be said of immigration. As a newcomer, I must conform to adult expectations without having been taught gradually, as a child, how everything works. As a result, I don’t know which signs to read as though my life depends on them, and which to ignore. New drivers in the UK are required to place a particular sign on their vehicle: a white field superimposed with a red block-letter “L,” which stands for “learner.” I feel as though I should have one constantly taped to my back. I have been in London for one week. On my previous three visits, I never stayed for more than two weeks, and often split the time with other parts of England or other countries in Europe. But this time, I am here to settle. My new job starts tomorrow. And so, I see everything, not through the eyes of a tourist, but those of an immigrant. Instead of laughing at quaint cultural differences, I take note for future reference. When I discover that the way I have been doing things in my homeland for decades, and which I assumed to be universal, works completely differently out here, I have to figure out the new way and adapt. Walking along the Thames last night, I felt a sense of connection to other immigrants I met. Some may have fled despotic regimes, others no doubt came to seek their fortunes. For many, English is not their first language (and I am discovering it is actually not mine either!) Few leave their families lightly. And abandoning the cumulative comfort of so many small known quantities has led me to feel like an infant here at times, re-learning fundamentals of language and behavior/behaviour. After a week of apartment-hunting, bank account setup, and other logistics required to survive abroad, an outing in Brighton yesterday with my new colleagues let me see things as a tourist again, instead of just an immigrant. Returning to the Thames that night rekindled the “match-head” that was placed in my thoughts many years ago, when I first encountered London, and found it at once imposing and familiar, both a great city, and one I could call my own. Last weekend, we drove down to Seal Beach to say farewell to my wife’s aunt. Her parting gifts to me were a bottle of champagne, two sleeping pills for the flight, and a small pin with an American flag on it. She met her American husband in England not long before he shipped off for the D-Day landing on the beaches of Normandy. I imagine it is always poignant to leave one’s home country. I liken my evolving relationship to my homeland to how I imagine a mother might regard her teenage son. I admire his idealism and energy, robustness and strength, the sense of freedom and possibility. I also notice with chagrin his sense of entitlement and invulnerability. I likewise find it hard to believe reports that he has become a bit of a schoolyard bully, taking advantage of others at times, and behaving recklessly in the hubris of youth. I love my country, and will miss it. But I am glad for the opportunity to live in the Old World as well. More than politics, it is the people I will miss, and of course the vast open spaces, encompassing nearly every biome on Earth. I will be glad, though, for a more immediate sense of connection with the continuity of human history. London itself has been continuously inhabited for more than two millennia, emerging and reemerging, phoenix-like, from each collapse. And so I say, “so long” for now to the beautiful and complicated place where I grew to become a man. I am not leaving my homeland due to political or religious persecution, or even necessarily to seek greater economic opportunity in another land. I am going because it is time to go have this adventure. And wherever I go, I will be an American. On Friday, I got up before dawn, as I often do. This time, however, it was not to write, but to listen. I walked two blocks to the clubhouse of a retirement home, where the local chapter of Toastmasters was in session. My father has asked very little of me in the six years we have lived across town from each other in the sleepy hamlet of Ojai, California. Today he wanted me to come hear him give a speech. I came away both moved and proud, reflecting on our thirty-two years together. At my request, my father has posted the text of the speech, as well as an audio recording of him reading it, on his own website. In the speech, he mentions my losing a son, his almost losing me, and how our experience of the fragility of life has shaped us, and our relationship. Needless to say, I will miss him when we leave.